Three people are facing felony charges stemming from a months-long drug investigation by the Boise Police Department. 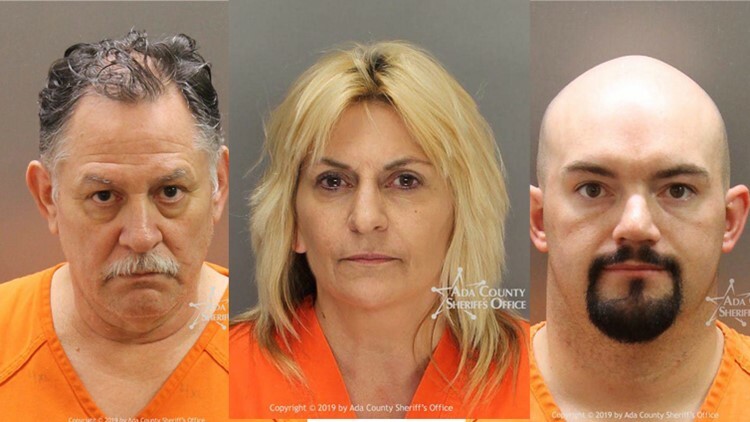 BOISE, Idaho — Three people are facing felony charges stemming from a months-long drug investigation by the Boise Police Department. Jerry Thumm, 59, Rachelle Hupp, 52, and Jesse Lawrence Brown, 33, were arrested Tuesday afternoon. Police say they had received a number of calls and tips from neighbors about drug use at a house located in the 7900 block of Wesley Drive, very near Morley Nelson Elementary, Fairmont Junior High, and St. Mark's Catholic School. In response to the complaints, Boise Police Neighborhood Contact Unit officers launched an investigation into the property and its residents that lasted several months. Officers were able to determine that the people at the house were using drugs, including around an infant, police say. Investigators were granted a search warrant for the home, which was served Tuesday by the Special Operations Unit and narcotics officers. Police say they found methamphetamine, drug paraphernalia and a gun inside the house, along with the three suspects, all of whom lived there. A baby under the age of one was also inside, police say, even though the home was dirty and "not conducive to raising a small child." The baby was placed in the care of the Idaho Department of Health and Welfare, and Thumm, Hupp and Brown were booked into the Ada County Jail. Thumm is charged with felony counts of injury to a child, drug possession, possession of a weapon by a felon, and probation violation. Hupp is charged with felony injury to a child and drug possession, while Brown is charged with felony possession of a weapon by a felon and misdemeanor frequenting a place where drugs are used. Hupp and Brown were due to appear in court Wednesday afternoon, while Thumm is scheduled for an April 18 appearance.